US equity indexes closed very mixed, sp +4pts @ 2167 (intra range 2151/82). The two leaders - Trans/R2K, settled higher by 1.9% and 1.5% respectively. Nasdaq comp' -1.8%. 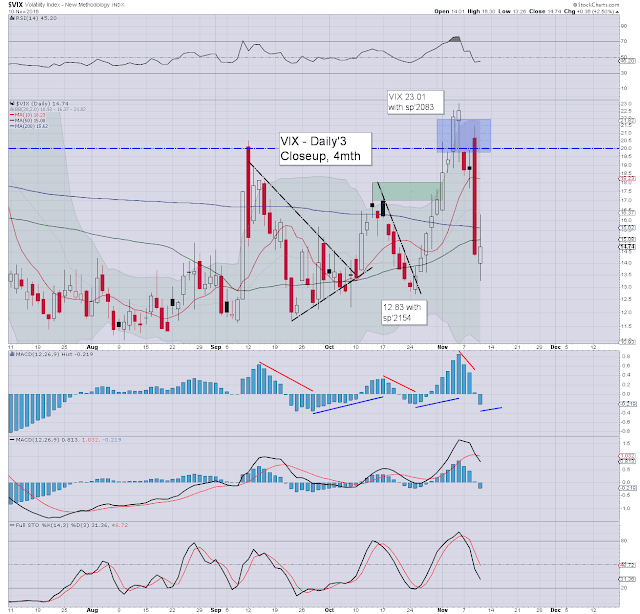 VIX settled +2.5% @ 14.74. Near term outlook still threatens some cooling, but broadly.. the trend is strongly bullish into early 2017. It was a particularly mixed day in equity land, with a very notable new historic high for the Dow of 18873. There was massive strength in financials, whilst there was significant weakness in many of the tech stocks. VIX opened in the 13s, saw a mini surge to the 16s, cooling to the 14s, and concluding with a late afternoon recovery to settle a little higher. 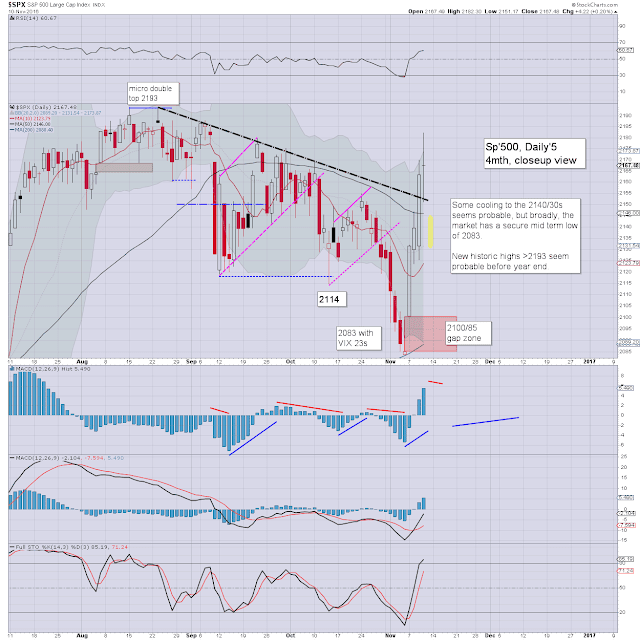 Cyclically - short term, the market looks highly vulnerable to broad weakness across Friday, and that could easily carry across into early Monday. Copper settled higher for the FOURTEENTH consecutive day, +3.7% @ $2.55, which is surely the most bullish run in six years... perhaps ever. 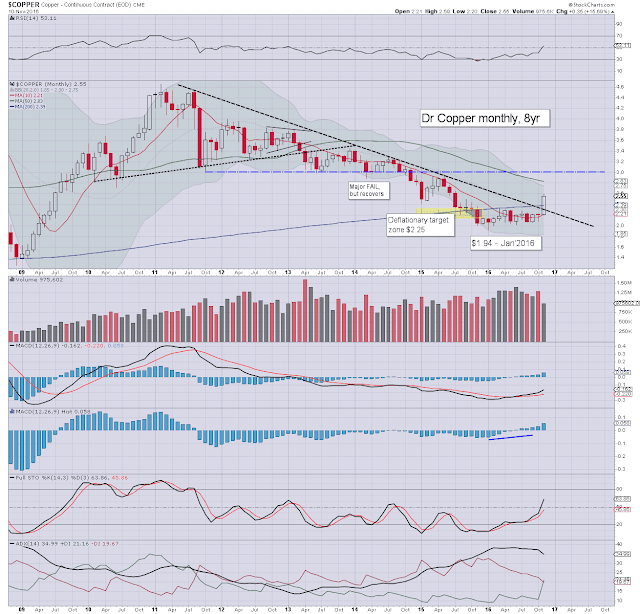 I've been watching copper across the year, and we finally have a decisive break above declining trend/resistance. The five year downward trend has indeed concluded, having cooled from $4.65 in Feb'2011, to a key low in Jan'2016 of $1.94. As many would agree, first natural upside target is the $3 threshold. A move into the $4s will clearly take many months, but it seems a realistic target in the latter half of 2017. The implications are very important, not just for the related copper miners, but the broader economy and indeed.. market. I recognise some might argue that even if Copper is around $3 by spring 2017, it doesn't necessarily equate to broader inflation in the world economy. Yours truly... would disagree. Mr Inflation is on his way, and that is indeed what the central banks have been trying to achieve for years. I'd imagine they will be rather pleased indeed.